Facts about Bellus Angelfish, "Scientific anme for Bellus Angelfish is Genicanthus bellus". Bellus Angelfish is a variety of angelfish that comes from the Pomacanthidae family. The Bellus Angelfish varieties are native to Indonesia and they rarely make their way into the aquarium business. The Bellus Angelfish breed is also called as ornate angelfish. Generally, the Bellus Angelfish fish breed prefers a tank with a minimum capacity of 120 gallons (454 liters). Generally, the Bellus Angelfish varieties are found in sea reefs, chiefly in the eastern Indian Ocean and western Pacific. The Bellus Angelfish breeds are found at a depth of about 300 feet (91.4 meters). Ideal water temperature for your fish is between 72 to78º F (22-25.5º Cel) and pH from 8.1 to 8.4. The specific gravity at 1.020 to 1.025. Bellus Angelfish is one of the smaller saltwater angelfish species and is not considered as dwarf species. The Bellus Angelfish breed is an average-sized, non-violent angelfish attaining a maximum body length of 7 inches (17.7 cm) when matured. The Bellus Angelfish varieties are sexually dimorphic; meaning the look between females and males is visible. 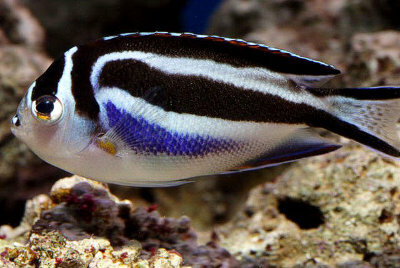 The female Bellus Angelfish breeds have a black, blue, and white to grey colored body, with horizontal, white, black and blue lines along their body that shift to perpendicular striping close to the head. The male Bellus Angelfish will have predominantly gray-colored body, with a yellow-colored line running straight across their body. Male Bellus Angelfish will habitually contain a yellow line that runs down the bottom of their dorsal fin. Both females and males will contain a tail that shrinks into their body, offering them the swallowtail look. Bellus Angelfish breed are nonviolent aquarium dwellers and will seldom bother their tank companions. The only exemption is that the Bellus Angelfish will be maintained with other angelfish, chiefly with the Genicanthus type. Moreover, not more than one male fish breed is supposed to be kept in an aquarium. A solitary male fish can be kept with many female fish. The fact is that a Bellus Angelfish are omnivorous, (definition-they eat both other animals and plants). The Bellus Angelfish varieties are omnivores, and they feed mostly on zooplankton and marine plants, particularly algae in the wild. In the aquarium, they are fed with meaty and frozen foods, such as Mysis, brine shrimp and shellfish. They also fed with several greens, particularly dehydrated algae. When first get your, Angelfish it may need to be given live foods such as freshly chopped seafoods or brine shrimp or to encourage them to eat. The average lifespan of the Bellus Angelfish breed ranges from 10 years to 15 years. Test the water when preparing your tank for your fish: You will need to purchase a liquid tester so that you can test for Nitrates and Ammonia. The strip-style test kits are unreliable and a waste of money. You should use a dechlorinating product to remove the harmful chlorine from the water. Test for nitrite, ammonia, and proper PH. The ammonia should always be 0, the nitrite should be 0, and the nitrate should preferably be below 20 ppm. If it's at or above 40 parts per million (ppm), you have too many fish or are not changing the water often enough. Cycling your tank is important, Follow the steps to cycle your tank. This establishes healthy bacterial and chemical levels. When buying your Bellus Angelfish see which one looks like the healthier fish in the tank. Be wary of tanks with dead fish in them, as this can be a sign of illness or improper care. Clamped fins are a sign of illness. In addition, healthy Bellus Angelfish will have no white spots, make sure they swim with their fins held upright, and have a nice rich color or colors. Make sure the Bellus Angelfish swim all over the tank and look healthy. When adding the Bellus Angelfish to the aquarium, it is important to introduce the fish to the tank environment slowly. As soon as you get home, float the entire, closed pet store bag (with the Bellus Angelfish inside!) in the tank on top of the water for about a half hour. This will allow the water in the plastic bag and the Bellus Angelfish to equalize out to the same temperature as in your tank, so your Bellus Angelfish does not get shocked by the different temperature. Next, add a small amount of water from your tank to the bag, and wait about 15 minutes. Do this at least one more time. Us a net to catch your Bellus Angelfish and then while the fish is in the net, dispose of all the water down a drain or outside. Then transfer the Bellus Angelfish carefully into the your tank. This process not only reduces stress for you Bellus Angelfish, it also prevents the dirty pet store water from contaminating your tank with disease. Remove 30% of the water from you Bellus Angelfish tank each month with new water, or a 15% water change every 2 weeks is ideal for keeping nitrates lower. With corals in the fish tank, then 20% water change every month, or 10% change every 2 weeks.